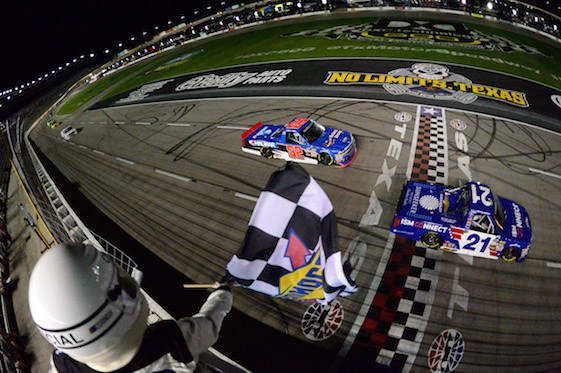 FORT WORTH, Texas – Johnny Sauter continued his uncanny mastery of Texas Motor Speedway Friday night, and who’s to argue that his latest NASCAR Camping World Truck Series victory here was a case of divine intervention. Certainly not crew chief Joe Shear Jr. after Sauter sputtered through Turn 3 of TMS’ 1.5-mile oval to hold off Stewart Friesen after a three-lap shootout en route to victory in the 22nd annual PPG 400. The series point-leader, Sauter posted his fifth career win on TMS’ 1.5-mile oval and fourth in eight events this season. But he and Shear Jr. had to gamble on fuel as the laps wound down and then keep pole-sitter Friesen at-bay following a restart on Lap 165 of the scheduled 167. Sauter finished 0.092-seconds ahead of Friesen, who was aiming for his first career Truck Series victory. As it played-out, Sauter and Shear collaborated for the closest margin of victory in series history at TMS. The previous MOV record was set during the June 9, 2006 Sam’s Town 400 won by Todd Bodine over Mike Skinner by 0.116-seconds. “This win is really special to me,” Shear said. “I lost my wife in late December (the 28th). She was born in Austin and lived most of her life in Dallas. She always came out here, family always came out here and this has always been a big race for me _ and still is. I’m so proud to win another one. It’s hard not to get emotional. Definitely (she was) looking over us today. We had to do a little strategy to win this thing…but God bless her soul. “I’ve been doing this all my life. I’m very competitive, I like to win. My wife was right beside me all the time and she was into racing just as much or more than I was. She’s up there, she’s coaching me, she’s telling me what to do. I’m proud to be here in Texas where she’s from. The year that we’re having, I look up to her and thank her all the time.” Chandra Shear was 43 when she died unexpectedly. Sauter took the lead for the first time on Lap 117 by passing GMS Racing teammate Justin Haley between Turns 1 and 2, and led the final 51 laps. Only two-time Truck Series champ Bodine has more wins in Cowtown, with six. Sauter has won six of the last 11 series races, and posted top-threes in 10 of the last 12. The native of Wisconsin now has 21 career victories in 229 series starts. With his win Friday night, Sauter became the third driver in series history to post four or more wins in the first eight races of a season. Kyle Busch and Skinner are the only other drivers to do so. Sauter now has compiled 16 top-10 finishes in 20 races at “The Great American Speedway.” Additionally, Sauter hasn’t started outside of the top-10 and has finished in the top-five in every race this season except for the half-mile Martinsville Speedway, where he placed 19th. Haley finished third in the No. 24 Fraternal Order of Eagles Chevy, his third top-10 result in three races at TMS. Friesen jumped ahead of Haley on the last restart, despite the latter’s best effort to block for his teammate. “It came down to that last restart there. I did everything I could to try to push him out of the way,” Haley said. “He did exactly what he had to do,” said Friesen, who settled for his first top-10 finish in three races at TMS, as well has his fifth top-10 result of 2018. Sauter increased his point lead from 59 to 77 over Noah Gragson, driver of the No. 18 Safelite AutoGlass Toyota Tundra fielded by Kyle Busch Motorsports. Already booked for NASCAR’s playoffs in November to determine a champion, Sauter warned about overconfidence. (1) Stewart Friesen, Chevrolet, 167. (10) Justin Haley, Chevrolet, 167. (8) Grant Enfinger, Ford, 167. (9) Matt Crafton, Ford, 167. (2) Todd Gilliland #, Toyota, 167. (20) Tyler Young, Chevrolet, 167. (14) Cody Coughlin, Chevrolet, 167. (4) Spencer Davis, Toyota, 167. (3) Noah Gragson, Toyota, 167. (28) Dalton Sargeant #, Chevrolet, 167. (19) Wendell Chavous, Chevrolet, 167. (22) Austin Hill, Chevrolet, 165. (6) Chris Eggleston, Toyota, 165. (16) Joe Nemechek, Chevrolet, 165. (11) Ben Rhodes, Ford, 164. (15) Austin Self, Chevrolet, 162. (7) Brett Moffitt, Toyota, 158. (17) Jordan Anderson, Chevrolet, Oil Cooler, 157. (25) Clay Greenfield, Chevrolet, 157. (30) Norm Benning, Chevrolet, 157. (21) Korbin Forrister, Toyota, 155. (13) Myatt Snider #, Ford, Accident, 105. (31) Jennifer Jo Cobb, Chevrolet, Accident, 102. (23) Josh Reaume, Toyota, Engine, 79. (12) Bo LeMastus #, Toyota, Accident, 73. (29) Reed Sorenson(i), Chevrolet, Overheating, 15. (27) Kyle Donahue, Chevrolet, Overheating, 13. (26) Bayley Currey, Chevrolet, Accident, 11. (18) Justin Fontaine #, Chevrolet, Accident, 6. (24) Camden Murphy, Chevrolet, Electrical, 4. (32) Todd Peck, Chevrolet, Electrical, 1. Average Speed of Race Winner: 115.66 mph. Time of Race: 02 Hrs, 09 Mins, 57 Secs. Margin of Victory: 0.092 Seconds. Caution Flags: 9 for 44 laps. Lead Changes: 12 among 9 drivers. Lap Leaders: S. Friesen 1; N. Gragson 2-20; T. Gilliland # 21-29; S. Friesen 30-32; B. Rhodes 33; S. Friesen 34-42; S. Davis 43-49; T. Gilliland # 50-75; G. Enfinger 76-82; T. Gilliland # 83-109; C. Eggleston 110-113; J. Haley 114-116; J. Sauter 117-167. Leaders Summary (Driver, Times Lead, Laps Led): T. Gilliland # 3 times for 62 laps; J. Sauter 1 time for 51 laps; N. Gragson 1 time for 19 laps; S. Friesen 3 times for 13 laps; S. Davis 1 time for 7 laps; G. Enfinger 1 time for 7 laps; C. Eggleston 1 time for 4 laps; J. Haley 1 time for 3 laps; B. Rhodes 1 time for 1 lap.